It is finding helpful and engaging reading material that you can actually understand…. That is exactly what inspired us to write this book. How is a student supposed to learn when language instructors love providing materials that are tough expert-level literature with tons of grammar and rules? That style of book for new language learners can be overwhelming, and lead you to flip back and forth between a dictionary and your book… constantly! Not an effective use of your time nor the best way to learn. Is this how children learn their language skills? No. Enter French Stories for Beginners Vol. 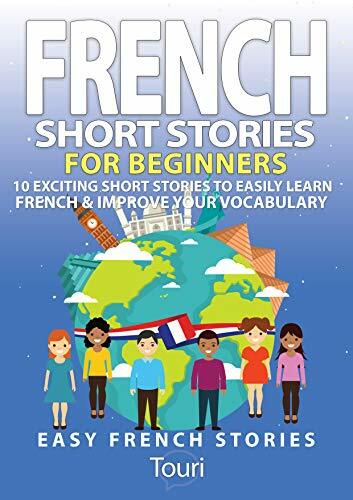 1: You will find 10 easy-to-read, engaging, and fun stories that will help you to expand your vocabulary and give you the tools to improve your grasp of the French language. Improve your comprehension, grow your vocabulary and spark your imagination with these ten unconventional French short stories! All stories are written using vocabulary that you could easily use in your day-to-day conversations. The stories are written with beginner French learners in mind. With that said, it is highly recommended to have a basic understanding of French to achieve maximum enjoyment and effectiveness of the lessons. This program is excellent for those who want to get an introduction to the language or brush up on their French language skills. Each story contains an important lesson in the French language (Verbs, Adjectives, Past Tense, Giving Directions, and more), involving an interesting and entertaining story with realistic dialogues and day-to-day situations. A summary in French and in English of what you just read, both to review the lesson and for you to gauge your comprehension of what the tale was about. At the end of those summaries, you’ll be provided with a list of vocabulary found in the lesson, as well as phrases that you may not have understood the first time! Finally, you’ll be given clever questions in French, so you can prove that you learned something in the stories. Even if you have tried multiple times to learn French these short stories will give you the jumpstart you need to finally grasp the language! Act now and grab your copy of French Short Stories and start learning the fun way!